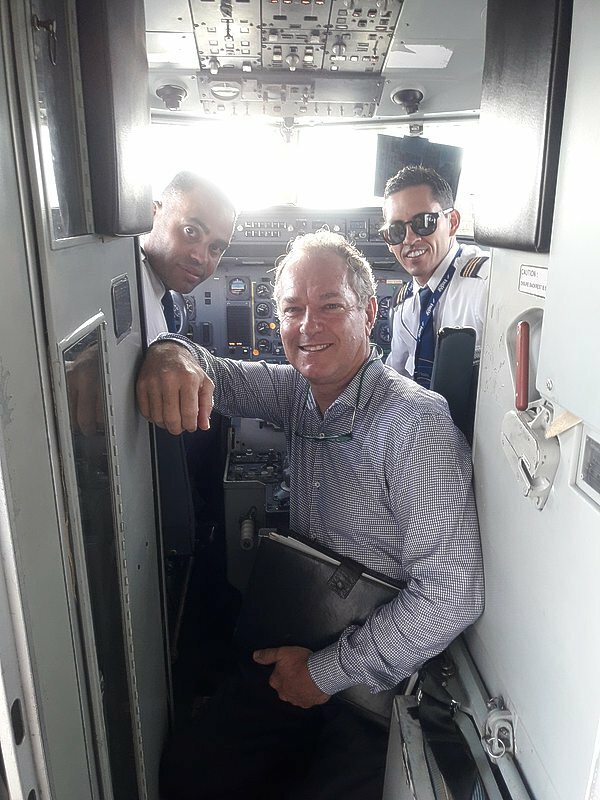 AIRPORT–The InselAir plane sitting for months in a corner of Princess Juliana International Airport has become a poignant symbol of a once-vibrant airline that was like a navel string tethering St. Maarten to Curaçao, Aruba and Bonaire. That string is now very frayed and is at risk of snapping. Repairing and securing that string is the herculean task recently taken up by InselAir’s new President and Executive Chairman Lars de Brabander. “It is a rocky road and it is going to be a very rocky road in the coming two to three months and then the light will become brighter,” he told The Daily Herald on a recent visit to St. Maarten. InselAir currently flies with only two leased two aircraft – a propeller plane and a jet – and has had a massive reduction of routes and flights. The airline’s third plane is the one sitting at St. Maarten’s airport. A new engine is in the process of procurement and should be on island and ready for installation in the coming month. “We need aircrafts to back in operation. We only make money if we fly,” said De Brabander. He said he has assured airport management the now flight-less airplane is planned to be off their runway before the high tourist season come mid-November. InselAir is also banking on a new “very reliable jet out of the United States” to replace the one currently leased one from Venezuela. The current jet is expensive, so a more cost-effective, but very safe alternative has been found to ply the jet routes. Getting back on track is not simple. The airline has a long queue of creditors who are only held back by a legal trusteeship imposed by the Court. This construct is aimed at giving InselAir an opportunity to right itself if possible. That “light” can only get brighter in his estimation from the combination of knowledge of what went wrong with InselAir (such as unchecked ambition) and the in-house expertise. “There are a lot of people who are very knowledgeable about how to run an airline. With that group of people, I see the light at the end of the tunnel,” De Brabander said. He pointed out that the airline has always had “a strong team,” but “haven’t had the right lead.” That has now possibly changed. There is a chance it will not all work out for InselAir, but there is “a very good chance it will,” said De Brabander. He based that viewpoint on the InselAir 2018-2022 recovery plan that was also given the trustee’s nod of approval when the trusteeship was extended just over a month ago for another 1½ years. There is also money owed to the airline; notably some US $60 million from its Venezuela operations. The current political climate in Venezuela makes it tricky to cash in on this outstanding payment. However, this is too big an amount to just write off the books. A strategic alliance is also seen as an option to keep InselAir buoyant. The airline is engaged in talks with Turks and Caicos-based Inter-Caribbean Airline. “We understand each other. We understand the common vision. So, if Inter-Caribbean finds us the party that they can take over or at least participate with, one way or the other we can work with each other. They have a great network in the Northern Caribbean territories,” said De Brabander. The Turks and Caicos airline “knows we are in pain, but they also know the value of Insel.” That value does not lie in the aircraft and hardware. De Brabander said the intrinsic value is in InselAir’s knowledgeable people, the routes and in the air operating certificate (AOC). A buyout of InselAir by Inter-Caribbean is a possibility, De Brabander is not ruling out for the future. He declined to put a price tag on InselAir in its current debt-burdened state. Any buyout, though, would have to take the vast number of creditors into account. While InselAir has talked to other parties in the past, including Synergy, the parent of Avianca Airline, and One Laser Group, the complete focus is now on Inter-Caribbean. “They have done the due diligence on Insel and we are now asking questions back. … We will see how that goes,” said De Brabander. A top goal, along with achieving financial viability, is to keep InselAir in the sky, but not at all cost. “We are dedicated to safety and therefore are also in the process of renewing our IOSA [International Air Transport Association (IATA) Operational Safety Audit – Ed.] safety certification, a requirement for being an IATA airline like InselAir, one of the few in the Caribbean. If one of my pilots or ground crew tells me there is an issue with a plane I would rather risk a delay than allow that plane to take off,” he said. He is keen on seeing the once-flagship Dutch Caribbean company regain its market share, on-time performance and, most of all, win back the trust of its clients. Winning back trust has started in-house with InselAir’s hard-hit employees. “I need to know they are with me on this journey,” De Brabander said. To that end, he has been meeting with his team members in one-on-one sessions and in groups to get their feedback and commitment. Getting employees on board is not simple, especially with cutbacks still on the books. The right-sizing of InselAir is ongoing and is a requirement of the Court’s trustee protection. Informing passengers about flight updates and changes in a more timely manner is also a major undertaking and goal for InselAir. A new InselApp is now available to download with live information on daily schedules. Affordable packages of airfare, accommodation and other add-ons are already on offer as a way to give customers more options, fill seats and boost the recovering St. Maarten economy. “For me, it is absolutely essential that InselAir within the next two to three months becomes, not per se the airline of choice, but we need to get the trust back with customers,” De Brabander said. Alle relevante curator en rechtbankverslagen inzake InselAir vindt u hier. Dit bericht werd geplaatst in _Curacao, Dossier InselAir, SXM-Daily Herald. Bookmark de permalink . De Brabander staat lachend en wel in de cockpit. Je moet maar durven an het geld van de belastingbetaler. Eugenlijk is het criminal te noemen! “vital Dutch Caribbean link”. I like a good laugh! It’s just toys for boys.